As soon as you sign in, we'll show you the latest exchange rates for each of our currencies. Select a currency and get a quote in GBP based on what you want to spend, or in the foreign currency based on what you want to buy. Just hit "checkout" when you are ready to process the order. Tip! We only hold exchange rates for 15 minutes once you checkout, so make sure you have your payment card handy if you haven't saved it already. Tip! 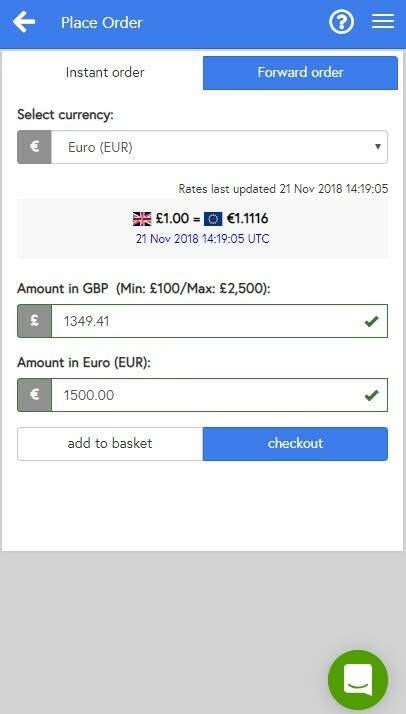 If you are going to buy more than one currency in this order, instead of "checkout" use "add to basket". 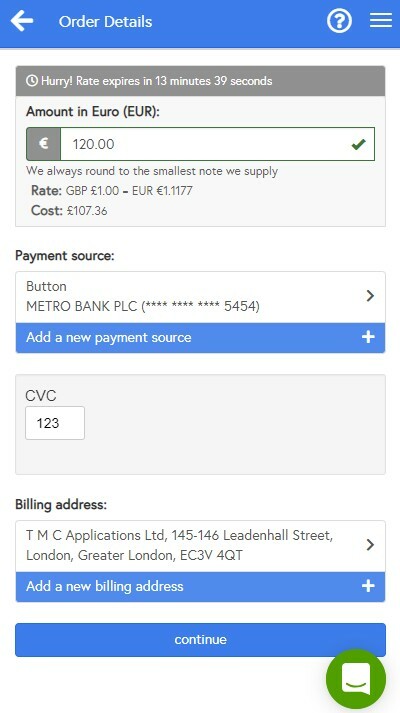 That way you can add up to 5 currencies to your order, as well as edit quantities and remove them. This feature is only available to Premium accounts. 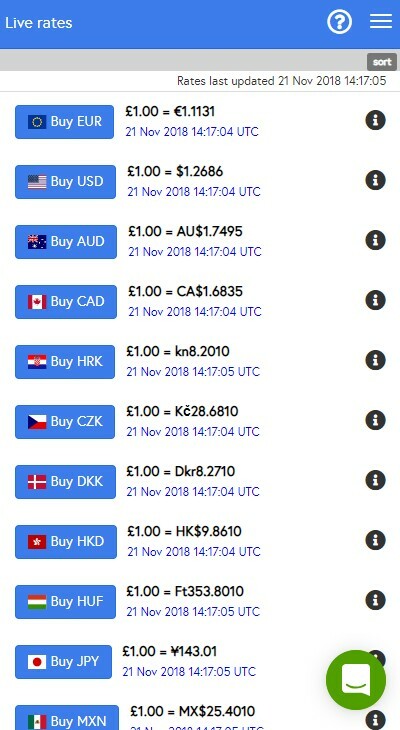 Standard accounts can only add a single currency to each order. You can upgrade from a Standard account at any time to access this feature. Tip! 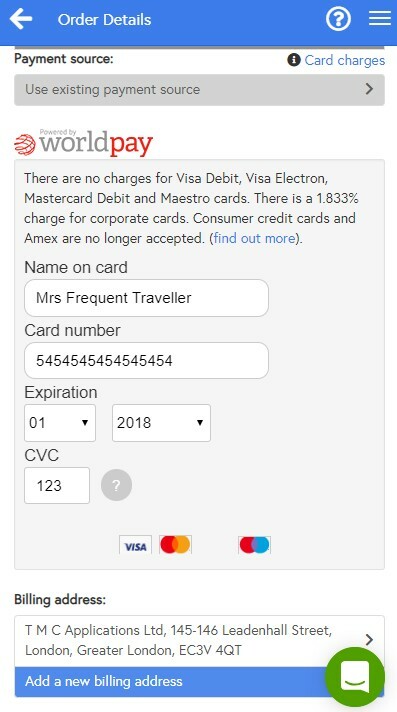 You can make payment with any card held in your name, so if you have a corporate card you may use this by amending the billing address. This feature is only available to Premium accounts. Standard accounts can only use a card registered at their verified home address. You can upgrade from a Standard account at any time to access this feature. Our delivery options are based on the availability of Royal Mail to collect orders from our distribution centre in London, so Public Holidays in England will affect the earliest available despatch date. 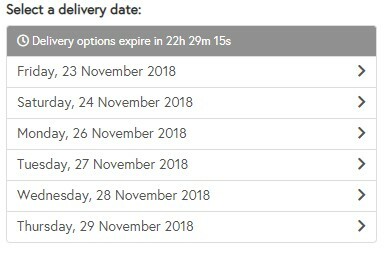 Public holidays in the delivery country will also affect the available delivery dates. Some currencies have an additional one day lead time at peak demand times, and this may also affect the earliest despatch date. Select an existing delivery address such as your home or billing address, or add a new address anywhere in the UK. Tip! If you have selected a delivery address that is not your verified home address, please note that Royal Mail will allow anyone at this address to sign for the delivery, so we strongly recommend that you make arrangements to check and sign for the delivery yourself. Acceptance of the delivery by a third party at the delivery address is the same as your acceptance and you will be required to indemnify us against any loss, damage or tampering which occurs after it is signed for. This feature is only available to Premium accounts. Standard accounts can only use their verified home address. You can upgrade from a Standard account at any time to access this feature. 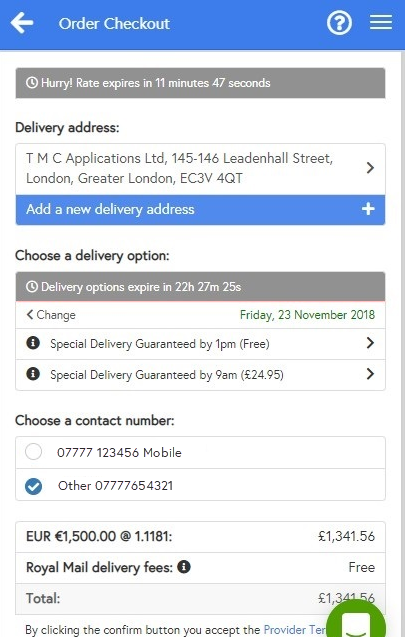 The default delivery option for Standard accounts is two business days by 1pm if you order before the daily order cut-off. The default delivery option for Premium accounts is one business day by 1pm if you order before the daily order cut-off. You can change the delivery date and we will show you all available delivery dates and options available on each day. This includes 9am and Saturday deliveries. We will also show you the cost where applicable for each available delivery option. If you have a Premium account, you can chose any business day in the next week for free delivery by 1pm. The most cost effective delivery option if you have a Standard account is two business days by 1pm. Tip! 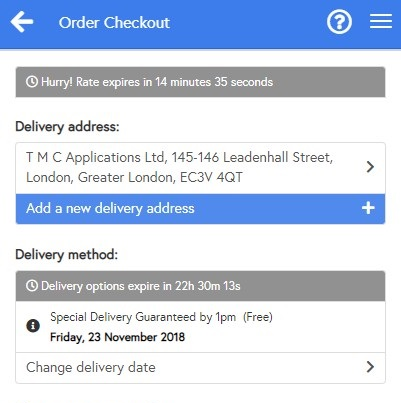 Watch out for the delivery options countdown as the available options may change at the order cut-off each day. 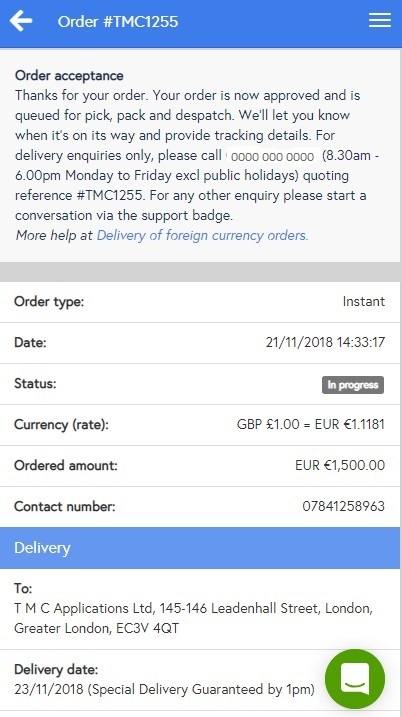 Check the details before confirming your order and submitting payment authorisation, as you will not be able to cancel the order once submitted. We will normally accept your order immediately, although occasionally we have to make a few checks before we can accept it.